Tickets available in person at the Annenberg Center Box Office during regular business hours. What do you look for when you riffle through the remains of history: the truth or yourself? 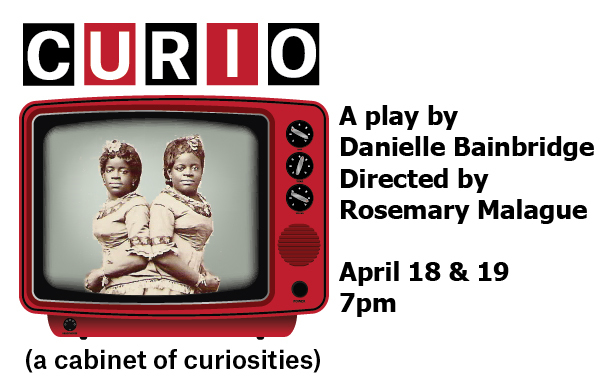 Curio (a cabinet of curiosities) follows an obsessive young researcher’s journey to uncover the true story of conjoined twins Millie-Christine McKoy, 19th century African Americans, former slaves, and freak-show celebrities. Toggling between the McCoys’ lives and the researcher’s pop-culture fixations, Curio takes us from lecture halls to musical sideshow performances, visiting classic American sitcoms and game shows along the way. This two-woman play explores how we can long for and love a past that continues to make us so sick. This play is produced as part of the Theatre Arts Program’s Edinburgh Project, with Penn alumna and playwright Danielle Bainbridge serving as artist-in-residence this spring. The running time of the play is approximately one hour. Each performance will be followed by a talk-back with the playwright. Refreshments will be served. Danielle Bainbridge graduated from the University of Pennsylvania with a BA in English and Theatre Arts. She is pursuing a PhD in African-American Studies and American Studies at Yale University, and will graduate in May 2018. She is the incoming postdoctoral fellow in African American Studies and Assistant Professor of Theatre at Northwestern University. Danielle’s research covers comparative work on African American and Caribbean theatre, performance studies, and literature from the 19th to 21st century . Her ongoing project, “Refinements of Cruelty: Enslavement, Enfreakment, and the Performance Archive,” examines the lives and archives of African American sideshow and freak show performers who were formerly enslaved and has received the support of the Beinecke Rare Books & Manuscripts Library and the Ford Foundation. She is also a writer of drama, creative nonfiction, and fiction. Her creative writing appears in Moko Magazine, Killens Review of Arts & Letters, and The Mechanics’ Institute Review Online. She was the inaugural winner of the 2015 Barry Lopez prize for creative non-fiction from Cutthroat: A Journal of the Arts (judged by Nick Flynn) and a semi-finalist for the Kore Press 2016 memoir award. She received a scholarship from the 2016 Tin House creative writing workshop in Portland, Oregon. She hosts, researches, and writes a web series about under-told histories for PBS Digital Studios called “PBS Origin of Everything" which you can find on YouTube and Facebook. Curio (a cabinet of curiosities) is her first play. She's in the early stages of writing her second play, with the working title The Mondegreens.